Home Film Film Reviews The Post: My God, the Fun! The Post: My God, the Fun! Steven Spielberg makes great entertainment out of a free press. Tom Hanks and Meryl Streep plan out the next move of The Post. Steven Spielberg’s The Post isn’t a great movie, but it is a timely one, and sometimes that’s even better. As we watch its characters deal with the Nixon White House, it’s hard to ignore how we, too, are living under a crooked, insecure, emotionally unstable president who will trample the Constitution to keep himself in power. Of course, with timeliness comes the danger that this film will lose its luster in some less turbulent future. Good thing its craftsmanship and acting makes it more likely to wear the years well. The story concerns the Pentagon Papers, a 47-volume classified internal study of the Vietnam War commissioned by Defense Secretary Robert McNamara (Bruce Greenwood). Outraged at the government’s lies about the war going swimmingly, former department aide Daniel Ellsberg (Matthew Rhys) illegally copies the pages. They eventually fall into the hands of the Washington Post, whose executive editor Ben Bradlee (Tom Hanks) wants to publish them. He sees a chance for his regional paper to claw onto an equal footing with more prestigious rival publications in New York City, Chicago, and Boston. Publisher Katharine “Kay” Graham (Meryl Streep) wants this too, despite her personal friendship with McNamara, but she also sees a chance for her family-owned newspaper to get shut down by the feds and ruined financially just when it’s offering an IPO. Spielberg also dots the cast with comedians, who make this movie feel like an ensemble piece despite the headliners. We get Alison Brie as Kay’s daughter, David Cross as a Post editor, and Zach Woods as a Post lawyer. Bob Odenkirk does particularly fine work as the reporter who tracks down Ellsberg and gets his hands on the papers. Meanwhile, the two leads are stellar at depicting a convivial working relationship. One early scene has Kay dredging up a recurring issue until Ben snaps, “Katharine, keep your finger out of my eye!” A minute later, they’re laughing together at a joke he makes. 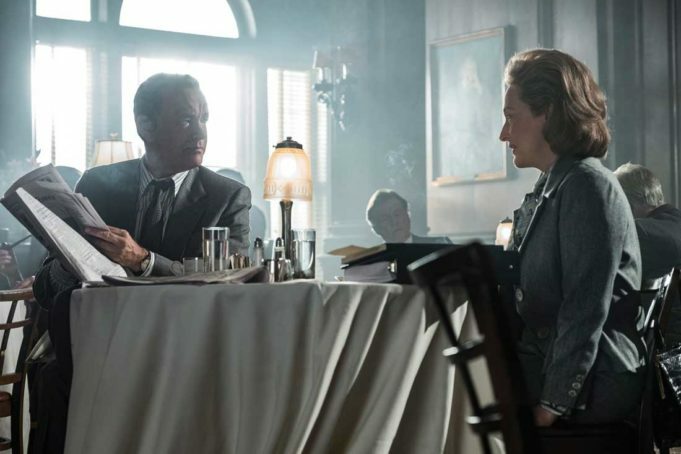 Hanks gets the best speech here about Ben’s friendship with John F. Kennedy clouding his journalistic judgment, but it’s Streep who has the better role as a woman steeped in the sexism of her era who listens meekly while one of her board members (Bradley Whitford) says she’s not qualified to run the paper. (Much later on, she finally stands up to that guy. It’s obvious, but it works.) While it would have been easy to gloss over the glitzy parties that Kay presides over, the movie shows how the social functions are part of the newsgathering process — she’s at a friendly dinner with New York Times editor Abe Rosenthal (Michael Stuhlbarg) when the word comes that Nixon’s trying to shut down his paper. The story hinges on Kay, who ultimately decides whether the Post publishes the papers. Streep is quite affecting as she plays this woman who fears being the one who loses her family’s business yet makes the brave call anyway and gets to see it come good. The Post isn’t as streamlined as that other great recent journalism procedural Spotlight (the films both credit Josh Singer as a writer), but it’s bigger in the right ways. Spielberg demonstrates marvelous skill as he follows through on the story’s journalistic, legal, political, and economic consequences. 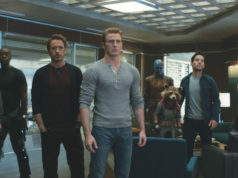 In the squabbling, hard-working employees of this barely solvent paper and its socialite owner who hides her troubles behind a party-hostess facade, Spielberg finds heroes of democracy. We always seem to need those. Starring Tom Hanks and Meryl Streep. Directed by Steven Spielberg. Written by Liz Hannah and Josh Singer. Rated PG-13.